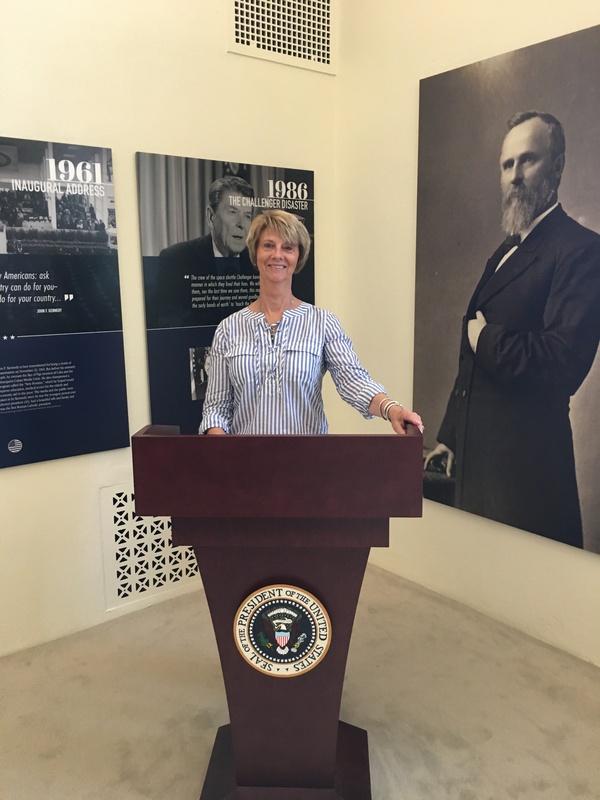 Spiegel Grove, Home of Rutherford B. Hayes – Let's Go RVing! It felt so good to sleep until 7:00 this morning – two more hours! We were supposed to check out at Building 16 at 8:00 but shopping at the Newmar parts store delayed us a bit since it didn’t even open until 7:30. We picked up a replacement light, some floor tiles and some floor protectors. (BTW, on the way out of the store a guy told us the floor protectors -we had to buy 7 – weren’t worth a dollar, we’ll see). It was 8:50 before we were checked out, paid up and on the road to Port Clinton, Ohio. We stopped once for a break and then once at Flying J in Perrysburg, Ohio for gas. Gas is significantly cheaper in Ohio than in Indiana by nearly $.25 a gallon (at some places – we found it varied a great deal). That is a significant savings! People occasionally ask me how many miles we get to the gallon. I used to check and it was a bit depressing, certainly less than the salesman told us it would be. Go figure. I finally decided that we were going to travel so it really didn’t make any difference what the mileage was. We try to conserve, drive at a reasonable speed and look for less expensive gas though but we do like Flying J because they have the RV gas line, easy in and easy out. 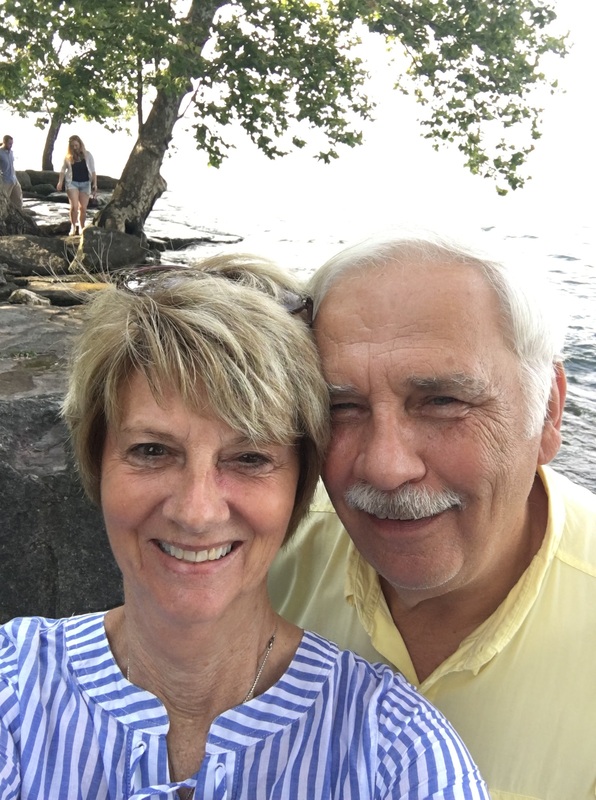 We arrived at Cedarlane RV Park in Port Clinton, Ohio around 1:30, quickly set up, ate a bar for lunch and then headed out for Spiegel Grove, the Rutherford B. Hayes home, museum and library. Unfortunately the library was closed due to flooding. We never did get any details on the flooding but there were large fans sitting around to dry things out. The house is quite large with 18 bedrooms and they were all beautifully appointed. President Hayes’ uncle built the house albeit a bit smaller and it was added onto later. President Hayes lived there on and off until his later years when his uncle gave it to him and it became his permanent home. There are numerous paintings and portraits throughout the house of not only Rutherford and his wife Lucy but also their descendants as members of the Hayes family lived in the house until 1965. It then became a private resident until sometime in the early 2000’s. It has been lovingly restored to its original look with some furniture that belonged to the Hayes and some that is authentic to the times. The house is four stories although we were only allowed to view two. Interestingly enough Hayes only served one term and that was by choice. He wanted to accomplish everything he could in one term and not worry about running for re-election. It was quite interesting to read about the Hayes’ election as it paralleled with our most recent election. Hayes’ opponent won the popular vote but did not win the electoral vote. In fact Rutherford and Lucy went to sleep the night before believing that he had lost the election. The story goes that they had a very restful night! Hayes’ wife, Lucy had a stroke at Spiegel Grove and died there three days later. Hayes continued to live there with his daughter Fanny and son Rutherford but he wrote that “the soul has left it”. Three and a half years later Hayes suffered a heart attack while in a railroad station in Cleveland. He had been in town conducting business for Ohio State University. His son Webb encouraged him to go to a local hospital but Hayes told him he would rather die at Spiegel Grove than live anywhere else so they returned to Spiegel Grove where he died three days later. The museum was quite interesting with a lot of memorabilia from the family. Also in the museum is a replica or the rotunda. Upon entering there is a bust of Rutherford and to the left is a replica of an office. His desk was beautiful and the walls were covered with notes written by former presidents all the way up to Barack Obama. One of the prettiest pieces of furniture was a secretary desk purchased by the White House in 1869 for use in the cabinet room during the Grant administration. 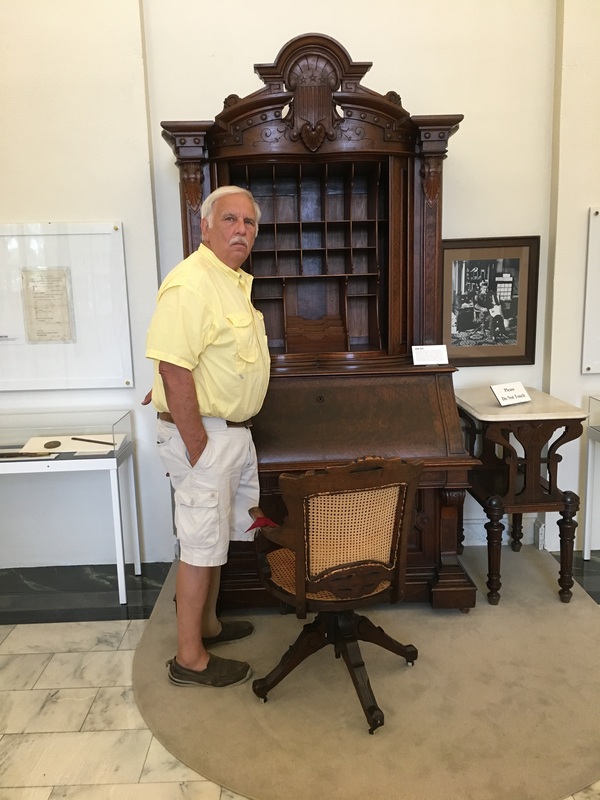 The massive secretary and chair were acquired by Rutherford’s son Webb in 1903 at an auction of excess furniture from the White House. 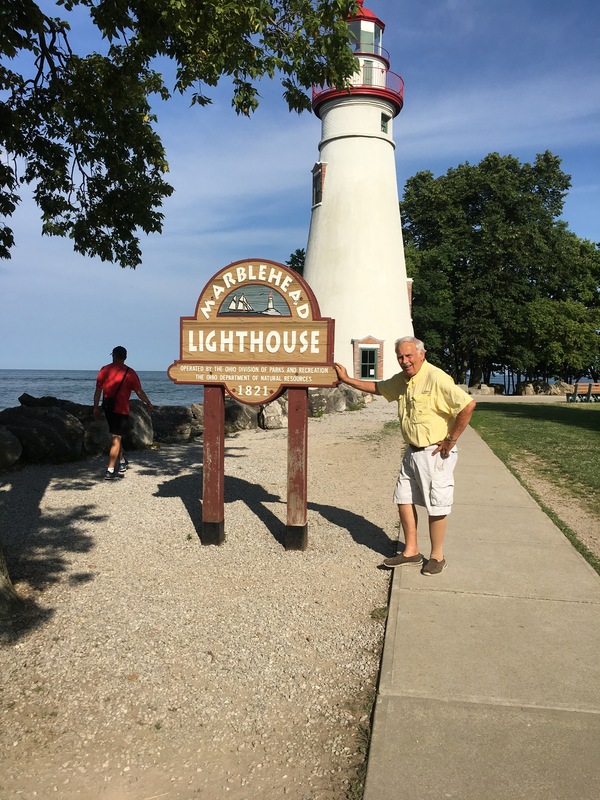 It was 5:00 when we left Spiegel Grove and we knew we couldn’t get into the Marblehead Lighthouse but we wanted to see it so off we went on a 45 minute drive – again! It is the oldest lighthouse in continuous operation on the United States side of the Great Lakes having guided sailors safely along the rocky shores of Marblehead Peninsula since 1822, and continues to be an active aid to navigation. We enjoyed gingerly climbing over the rocks and putting our fingers in Lake Erie. We walked around a bit enjoying the warm sun and the breeze. I told Jerry that despite all of our touring and running around I didn’t feel like I had hardly been in the sun. For just a few minutes I sat at a picnic table with my face toward the sun just enjoying a small bit of relaxation and stress relief. When we left we were both pretty tired so other than a stop at a grocery store we headed back to the campground. We had planned to grill a steak but it was late, we were tired and we had some spaghetti sauce. It was a nice evening and would have been a nice night to sit outside and read but we were both spent so we never set foot outside! An early night for us as we want to be on the road fairly on the way to Coshocton.